The goal of this center is to distill the unique essence of Taiwanese handicrafts and promote this globally. A. One of the center's novel handicraft creations. B. In a cupboard is a bright-red three-inch shoe for traditional, bound feet, made wth very elaborate embroidery. C. Here you can enjoy a cup of tea with a simple, unglazed earth-colored pottery tea set, a mat seat and a Shino (Japanese-style pottery) vase. D. The Bu-Wu Crafts Workshop from Alishan made this Tsou Aborigine tribe wild boar-themed wooden ware. The symbols represent different meanings: the golden rain trees for love, shields for protection, millet for harvest, and warriors' armbands for glory. The colors and lines are very original and striking. These items include Little Boar Key Chains (NT$250). E. A lacquered owl adjustable chain (NT$2,600) glows like a jewel. 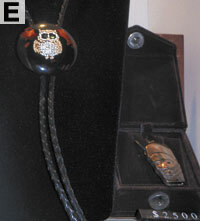 Beside it is a face-tattoo pendant (NT$2,500), which is actually a very unique USB flash drive. Besides these finely-made items there is a half-day crafts workshop taught by handicraft masters. The center also offers short and medium length lessons from certified crafts experts, crafts-related lectures and exhibitions. 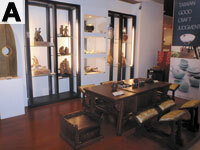 This center is truly an ideal place to see and purchase unique, beautiful "Made-in-Taiwan" gifts.